Habit: Bulb oblique-elongate to +- erect-ovoid, scales unsegmented, 2-segmented, or generally indistinctly 2(3)-segmented. Flower: perianth parts generally 6.2--9.5 cm, recurved in distal 33%, turning deep pink or lavender, abaxially generally +- purple, often faintly so, adaxial yellow midrib generally 0; anthers cream, turning yellow, pollen pale (bright) yellow. Fruit: generally ribbed. Citation for this treatment: Mark W. Skinner 2012, Lilium washingtonianum subsp. 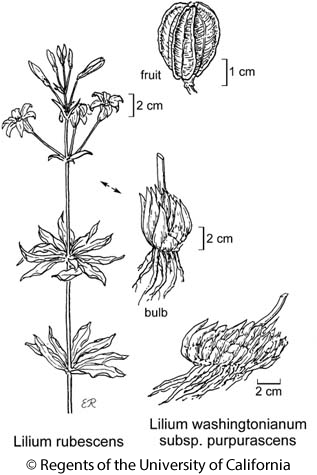 purpurascens, in Jepson Flora Project (eds.) Jepson eFlora, http://ucjeps.berkeley.edu/eflora/eflora_display.php?tid=76936, accessed on April 25, 2019.